LAFAYETTE, LA. - ULL Performing Arts alum, Outstanding Graduate, and Kennedy Center American College Theatre Festival Honored Playwright, Brian Egland will premiere his new play, She Still Dreams, at Cité des Art, 109 Vine St. October 17th through October 27th. She Still Dreams follows Savannah through her life and dreams, while telling the story of a girl that once carried a special light inside of her who now, as a woman, lives a quiet life with a husband who doesn’t talk. The light that she had has dimmed, not because of the life that she lives, but because she has accepted less for herself. The light, however dim, however faint, still exists because She Still Dreams. The show stars ULL theatre students Missi Shepherd and M.J. Battley, BET’s Sunday’s Best finalist, Nebu Neezy, and Billboard Hip Hop Award honored recording artist Jru Starz. General admission to the show is $15; $12 for seniors and students with valid I.D at the door. Performance times are 7:30 pm and at 2:00 pm for the matinee performances on October 20th and 27th. A trailer for the show, publicity photos, and cast interviews can be viewed at www.PlaysByBrianEgland.com. Tickets can be purchased by phone at (337) 291-1122 or online at www.citedesart.org. 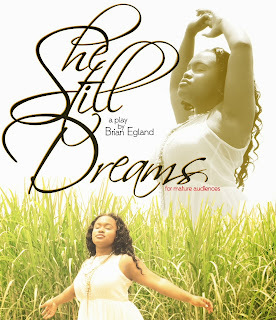 The performance dates for She Still Dreams are: October 17, 18, 19, 24, 25, & 26 at 7:30 pm. October 20 & 27 at 2:00 pm.